This document demonstrates the Human encryption mode built into PassLok Privacy and URSA, which is designed to be performed by hand if necessary. PassLok Privacy is available from https://passlok.com/app, URSA from https://passlok.com/ursa. The user starts by selecting three alphabetical keys: the first two are used for substitutions, the third as a mask for a random seed. The process begins by concentrating the entropy in the first two keys by means of serpentine operations on a Tabula Recta. Then a pseudo-random keystream is produced starting from a randomly chosen alphabetical seed of equal length as the third key, by means of a lagged Fibonacci generator that uses the Tabula Recta with headers modified according to the first two keys. Finally the processed plaintext (the method uses a trick to preserve spaces) with the random seed prepended to it is combined with the keystream to produce the ciphertext. To decrypt, the first two keys are compressed and then the random seed is extracted from the ciphertext, which allows us to reproduce the same pseudo-random keystream. This is then combined with the ciphertext to recreate the plaintext (and then the trick is reversed to get the spaces back). First take keys 1 and 2 with spaces, puctuation, and diacritics removed, and write each of them, one letter per cell, in a table containing 25 colums. When the first row is filled, continue filling the second, and so on until all letters have been written. Then do the following for each resulting column: look the first letter on the top of a straight Tabula Recta (alphabets on the edges are not mixed), then down that column until you find the second letter(if there is one), then left or right until you find the third letter (if there is one), and so on until the last letter is found, and then again perpendicularly to read of the result at top, bottom, or one of the sides. Write down the result for each column, and then you get the compressed key. 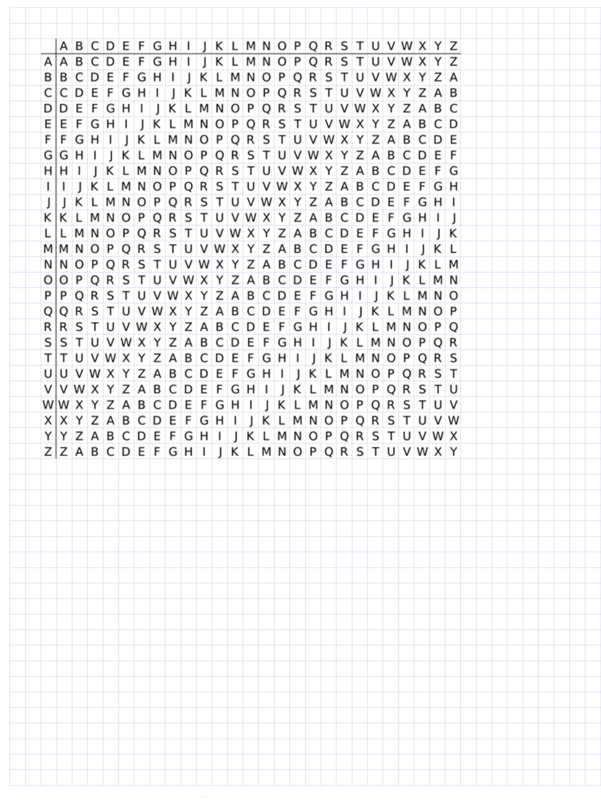 Then we generate a scrambled alphabet for each compressed key. The process is simple: 1, take the compressed key and write down new letters in the order they appear; if a letter in the text key has already been written, write instead the first letter before it in the alphabet that is still available (wrap around to the end if needed); 2, then write the rest of the alphabet in reverse order (this is done only for the substitution alphabets, not for transposition). Place alphabet 1 on the left side and right sides of the Tabula Recta, alphabet 2 on the top and bottom. From now on, we will look up letters on these rather than of the original headers. If encrypting, write a string of random letters as long as key 3, which will become the random seed, and then the processed plaintext immediately to its right. When decrypting, just write the ciphertext. Take key 3, remove all spaces, puntuation, and diacritics, and write it at the start of the line below the plaintext or ciphertext. If decrypting, extract the random seed from the ciphertext by following the process in step 5 just for those few letters, bearing in mind that you look up the top row letters on the left or right of the Tabula Recta, and write into the bottom row the letter found at top or bottom of the table. Skip this step if encrypting. Extend the seed (start of the first row if encrypting, of the third row if decrypting) into a keystream so all spaces in the second row are filled, this way: Look up the first keystream letter still available at the top or bottom of the Tabula Recta, then down or up until you find the letter that follows it in the keystream, then go left to read a letter on the right or left alphabet, which you will write in the next available position on the second row. Mark the first keystream letter you looked up, so next time you start with the next letter. Notice that when encrypting you start taking letters from the top row, but when you run out of random seed you continue taking them from the second row, never from the plaintext itself. Now when encrypting do the following for each pair of letters consisting of a top row letter and the letter right below it: Look up the plaintext letter at the top or bottom of the Tabula Recta, then go up until you find the letter below, then right to read a letter on the right or left alphabet, which you will write below the pair of letters you involved in this operation, forming the ciphertext. When decrypting you do the same but with the alphabets reversed, that is, you look up the top row letter on the left or right, and read off the result at top or bottom. If encrypting, you are done at this point. If decrypting, you now need to undo the plaintext processing. That is: replace every Q with a space, or a period and a space if there are two Q's in a row; replace every instance of "KU" followed by a vowel with "QU". The result won't be exactly the original plaintext, but it will be quite readable. It is OK to use keys that have been used before, even for a message of identical length as a previous message. The straight alphabet is used for key 2 if its box is left empty. If you want to use for key 3 a string different from key 1, write it in this box, otherwise key 1 will be used. This key should be at least three characters long. We make scrambled alphabets out of keys 1 and 2, which are then placed at the top, bottom, and sides of the Tabula Recta, by doing the following with each compressed key: take each key and write the different letters of the alphabet in the order they appear in the compressed key, if a letter has been used already, write instead the immediately preceding letter in the normal alphabet not yet chosen; if there are letters that did not appear in the key, write them now in reverse alphabetical order. The resulting alphabets are displayed on the bottom rows of the preceding work tables, and directly on the Tabula Recta. In order to obtain the ciphertext we generate the table below, following the instructions at the top of this page. The top row is the input, the middle row the keystream, the bottom row the output. The raw ciphertext (plaintext when decrypting) was the bottom row of the work table and is shown in the first box below, but when decrypting we now replace every "QQ" with a period plus a space, every single "Q" with a single space, and every instance of "KU" followed by a vowel with "QU" resulting in the plaintext in the bottom box. When encrypting, the bottom box contains the ciphertext split into codegroups of five characters each.